It’s tough to be a panda. There’s all that bamboo to eat and the forest can sometimes be a very dangerous place. Can you help this panda stay out of trouble and take care of its adorable family in this 3D simulation game? These 3 pandas are ready to live a fantasy adventure of the next level. Solve puzzles in the level, unlock mysteries and try to help the pandas escape in one piece from this fantastic world of mystery and fun! The bamboo-loving trio just had their vacation ruined by some thieves. Can you help them get home safely? Expect plenty of wacky adventures when this trio hits the shores of South America. How could three cute little pandas get into so much trouble? You’ve gotta do something! Collect delicious fruits and feed them to the cute panda in this free online game! This teen loves panda bears. Let’s give her a hairdo that’s as cute as one. 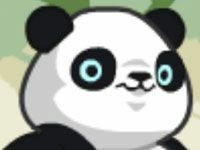 Paging Doctor….Panda? That’s right! This amazing animal is working in the ER today. Can you help him with his next round of patients in this medical simulation game? Manage your staff in this family fun online game, Panda Restaurant 2. Make sure that your customers are satisfied and want to come back to your high-quality restaurant. Serve them only the best dishes and desserts! Take great care of your customers in this family fun browser game, Panda Restaurant 3. Make sure that all your customers are happy as you serve them delicious dishes and desserts. This cute panda got a little carried away while she was eating candy bars in her favorite garden this afternoon. Now she’s all covered in chocolate! Can you help her get cleaned up in this adorable online game? Pick the perfect flower for your adorable panda girlfriend and she'll love you forever! This panda is determined to make a break for it! Can you get him to stay put within this lush meadow? Put up wooden barriers that will prevent him from escaping in this adorable puzzle game. This bouncy bear just found himself in a pinball machine. Can you help him gobble up all of this tasty fruit? Join Panda on a mad dash to collect jewels and clear the jungle—you’ll bear-ly make it out alive! Answering a call of nature leads to some time machine mayhem for this panda! Panda’s out for lunch, but he’s in a real hurry…how far can you make it before he bails? No wonder everyone loves this bear: He's a jammin' DJ who really knows how to work a turntable! You're one bad, bamboo-weilding panda...just don't bring the tower down on yourself! Try to reach the flag with the fewest possible strokes. It's war in the world of robot pandas. Try to save the real pandas! It doesn't get much cuter than baby Panda's on trampolines. This little panda is on the move! Can you keep him safe while he collects coins and explores this mysterious kingdom? You’ll also need to watch out for flying arrows in this action game.